The soldiers who were ambushed in Niger had set out to catch or kill the leader of an ISIS affiliate, officials say. WASHINGTON — The four U.S. soldiers killed in Niger last October were trying to capture or kill a senior ISIS terrorist, but the two officers in charge of their 12-man unit misled their higher-ups by reporting they were going on a far less risky mission, according to two U.S. officials and a congressional official familiar with the classified investigation of the deadly ambush. The three officials say that the investigation, which will be briefed to Congress this week, found that both men believed they had the authority to carry out a capture or kill mission against a high-value target even if they had filed paperwork for a less risky operation — because other officers in the area had previously bypassed the same basic military procedures. The 12-man Special Operations Task Force left Niamey, the capital of Niger, on Oct. 3, 2017, intending to track down Doundou Chefou, code name Naylor Road, leader of an ISIS affiliate called the Islamic State in the Greater Sahara. Accompanied by 30 Nigerien troops, the U.S. team headed for an area near the Mali border. Chefou is believed to be the architect behind the October 2016 kidnapping of Jeffery Woodke, a 57-year-old American aid worker. Woodke was kidnapped from his home in Niger by armed men and taken to Mali. Before leaving Niamey, the officials say, the two Army captains leading the 12-man team, one in charge of the team on the ground and the other a team director based in Oaullum, Niger, filed a mission plan for "key leader engagement" and reconnaissance — meaning they said the team was just going to meet with local leaders and gather information. But the three officials told NBC News that interviews conducted during the Pentagon's investigation revealed the two captains had intentionally filed an incorrect mission plan. Despite what the two men filed, the mission was always intended to be a capture or kill operation against Chefou. The misleading "key leader engagement" mission was approved and the team set out from Niamey. The assessment by U.S. military leaders on the ground was that contact with the enemy was unlikely, according to an October briefing by Joint Chiefs Chairman Gen. Joseph Dunford. But that assessment was based on the belief the team would be conducting a reconnaissance mission, not the mission the team was actually pursuing — trying to capture or kill a terrorist. Pentagon spokesperson Maj. Sheryll Klinkel said she could not comment on the investigation before it is released publicly. Three U.S. defense officials familiar with the investigation told NBC News what happened after the 12-man team left Niamey on its mission. In other words, the 12-man team was being asked to do something very similar to what it was already trying to do — find Chefou and capture or kill him. But where previously the men had been the self-appointed "primary team" secretly chasing the ISIS target, say the officials, now they would be the secondary force supporting the team that had actually been ordered to find him. Within hours of this official change of mission, however, the "U.S. government team" that was coming to the area to lead the pursuit of Chefou was delayed due to weather. The 12-man U.S. team and their 30 Nigerien counterparts then called off their revamped mission and began to head back to base in Niamey. The Nigeriens were low on food and water and stopped in the village of Tongo Tongo for supplies. The Americans took the opportunity to meet with local elders — a "key leader engagement" of the type described in their original, incorrect paperwork. The Americans and the Nigerien soldiers left Tongo Tongo to continue their journey back to Niamey. About 100 meters after leaving the village, however, they were ambushed. The attack was small at first, with just a few shots. But the Americans were so caught off-guard that not all had their protective gear on when it began. The Americans returned fire and fought back, even advancing towards the incoming fire — unwittingly moving straight into the kill zone. When they reached the kill zone, the strength of the enemy force became clear. More than 50 militants overwhelmed them with firepower. The ISIS fighters had drawn the Americans into a well-prepared ambush, said the officials. The militants had small arms, rockets, machine guns, and technical vehicles with mounted machine guns. They hit the Americans and the Nigeriens with sustained and accurate mortar fire and powerful direct fire. The U.S. soldiers were not equipped for sustained engagement. They were armed with small arms, machine guns, and a single-shot grenade launcher. The team included three American trucks with four passengers in each and at least six Nigerien vehicles. Sgt. La David Johnson, an Army mechanic from Miami Gardens, Florida, was separated from the group when he and two Nigerien soldiers sought refuge from the attack in some brush. As a truck with a mounted machine gun pursued the men, Johnson ran across a field to find cover. A runner and athlete, he was able to race about one kilometer away before he was struck by 18 bullets. "He went down shooting," said one official familiar with the report. Johnson's body was missing for nearly two days while U.S., French and Nigerien forces searched the area. Three other U.S. soldiers, Staff Sgt. Bryan Black, Staff Sgt. Jeremiah Johnson and Staff Sgt. Dustin Wright, were killed in the firefight. Five Nigerien troops were also killed, and two U.S. soldiers were wounded. ISIS militants tried and failed to remove some of the bodies from the scene of the attack, according to two U.S. officials. They declined to provide details. U.S. military officials have already changed certain rules of engagement in Niger since the attack. If U.S. soldiers in the area go out in the field with their Nigerien counterparts, they must have a surveillance drone overhead. This has already saved lives, according to one U.S. official. In early December, U.S. soldiers out on patrol with the Nigerien military came upon an ISIS training camp. As they neared the camp a radio call from a drone base in Garoua, Cameroon, warned them of a huge concentration of enemy fighters on their flank. The U.S. found out about the enemy presence just before the gunshots started and they were able to return fire and escape without any casualties. The classified report on the Niger attack compiled by investigators recommends specific changes to training and oversight to ensure soldiers understand procedures, say officials. The Pentagon report is more than 6,000 pages long and includes interviews with nearly 140 people. 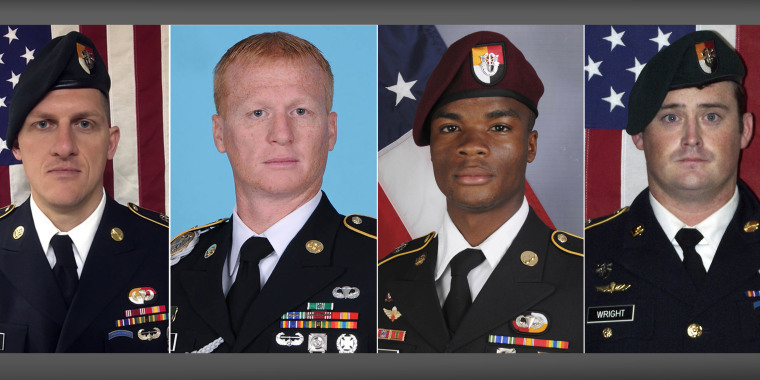 The families of the four fallen soldiers each received a briefing on the report the last week of April and first week of May, and leaders from U.S. Africa Command will conduct a series of classified briefings on the report for members of Congress this week. The leader of the investigation, AFRICOM Chief of Staff Maj. Gen. Roger Cloutier, and the commander of AFRICOM, Gen. Thomas Waldhauser, will conduct the briefings.